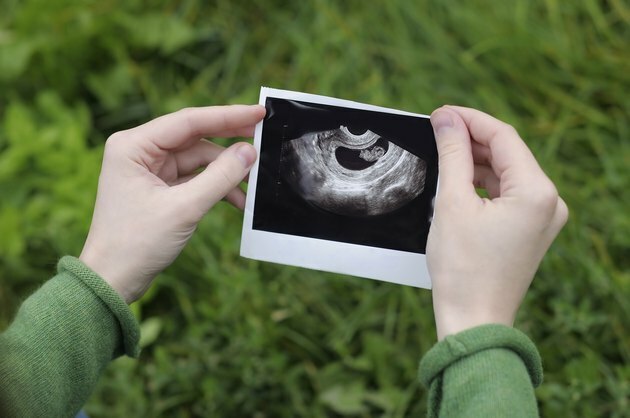 A baby sonogram, also known as an ultrasound, is a common procedure during a pregnancy. Sonograms emit high frequency sound waves from a transducer placed on the mother's abdomen. The fetus is scanned by rays of repetitive ultrasound beams that reflect back to the transducer and onto a monitor screen. Sonograms are used for tasks such as confirming pregnancy and gestational age, and monitoring fetal heart rate, position, size and gender. Calculate the gestational age of the fetus. Measure the crown rump length, or CRL, which is the length from the top of the head to the bottom of the buttocks. The CRL is measured between 7 and 13 weeks, and and can be recorded in inches or centimeters. The length is compared to a chart to determine gestational age (see Resources). Avoid changing the due date if later scans show a different CRL, as this may indicate that the fetus is not growing properly. Measure the biparietal diameter, or length between the two sides of the head. Measure at 13 weeks, and look for a 2.4 cm distance. Measure the length of the femur, or thighbone, to help determine the baby's longitudinal growth. The femur is the longest bone in the body, and should measure about 1.5 cm long at 13 weeks. Judge the weight and height of the fetus by doing an abdominal circumference measurement. An abdominal circumference measurement is the most important measurement in the late stages of pregnancy, according to Obstetric Ultrasound. If the abdominal circumference is not measured, any major problems with intrauterine growth will be missed. Examine the fetal measurements to look for any structural abnormalities. The absence of fetal nasal bones, and shorter than average femur and humerus bones, could indicate Down syndrome.